…This artwork commemorates a social event (the Spanish Embassy was opened in 2009) but it is far from being a historical painting. Only four figures have a social meaning: the king of Spain and the first ambassador in New Zealand, who were at the official opening, and New Zealand's Prime Minister at the time and an independent "witness", who were not). The remaining of the painting highlights cultural stereotypes, making the artwork a cultural approach, foremost. 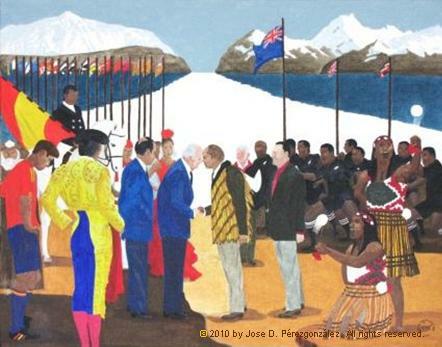 …The artwork is divided into two groups of figures vertically, with the New Zealand side slightly larger than the Spanish side. It is inspired on The Surrender of Breda, by Velazquez, albeit quite loosely. The figures are highly contrasted and the colours are bright, and a very perceptible tonal composition underlines the artwork. This helps emphasize the cultural intention of the painting while limiting its realism. There are, however, several colour arrangements that help keep the composition together, despise above extremes. …The top mountains represent the highest peaks in both countries (Mount Teide in Spain, and Mount Cook in New Zealand). They are separated by a stretch of ocean, representing the physical distance between both lands. The events unfolding below close the gap by way of a political and cultural interchange on an undefined piece of land in New Zealand, where the events take place. …Mount Teide frames the regional flags of the Spanish autonomous communities, which also represent the cultural and political diversity of the country. The Spanish flag is not yet raised, as it is part of the ambassadorial coming into New Zealand. A few cultural icons further represent Spain: an Andalusian horse, a Pamplona's runner, a flamenco dancer, a Saint James's pilgrim, a football player, and a bullfighter. …On the New Zealand side, the Tino Rangatiratanga and Union flags loosely represent the cultural identities of the country. The New Zealand flag flies big and tall, representing the unity of the country and the welcoming of the ambassadorial group. The welcoming is further emphasized by the hongi, the haka, and the poi dance, which, together with the traditional maori costumes and the rugby team, represent the cultural icons of New Zealand.